QUESTION: I am a mega dollar bull – I totally get how it is the only game in town. I’ve lived it too, having seen how the big banks work their balance sheets from the inside. However… occasionally people send me charts like the one below and get all excited. They say we are de dollarizing etc. My off the cuff remark is that the central bank reserves are a tiny part of daily FX transactions. Just wondered if Martin might comment on the blog? ANSWER: Hello. Hope the institutional desk is keeping you young these days. Your chart is interesting, no doubt. The central banks have been trying covertly to defend against the dollar. Even China and Russia are desperately trying to price things outside the dollar, but this is not helping either. 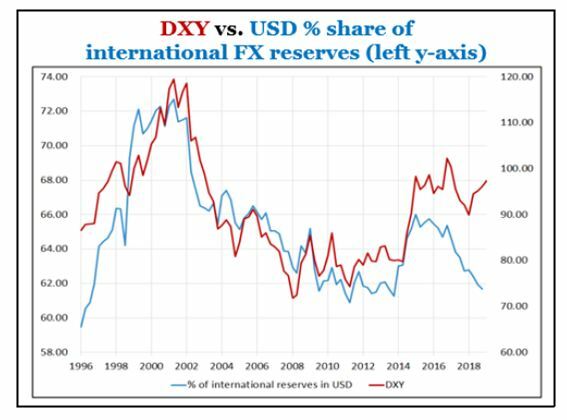 The U.S. dollar’s share of currency reserves as reported by the International Monetary Fund (IMF) fell to a near five-year low going into the end of 2018. The Chinese yuan’s share of allocated reserves shrank for the first time in the third-quarter 2018 since the IMF began reporting its share of central bank holdings in the fourth quarter of 2016. Insofar as the Japanese yen, reserves reached a 16-year high in the third-quarter 2018 according to the IMF. The central banks have been trying to use reserves to help support their respective currencies and suppress the dollar’s rally without any real impact. This is very similar to the crisis of 1927. Back then, there was also a capital flight from Europe. 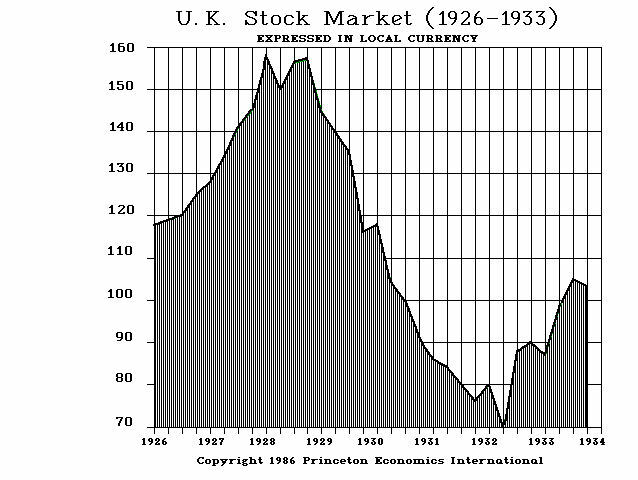 There too, the European share markets all peaked well before the US market in 1929. The capital flight from Europe to the dollar was massive. This was one of the criticisms of the Fed made by Milton Friedman that they did not expand the money supply with all of the refugee gold hopping on every ship to the USA. The three main central banks of Europe traveled to New York City for a secret meeting. You might call this the first G4 in history. 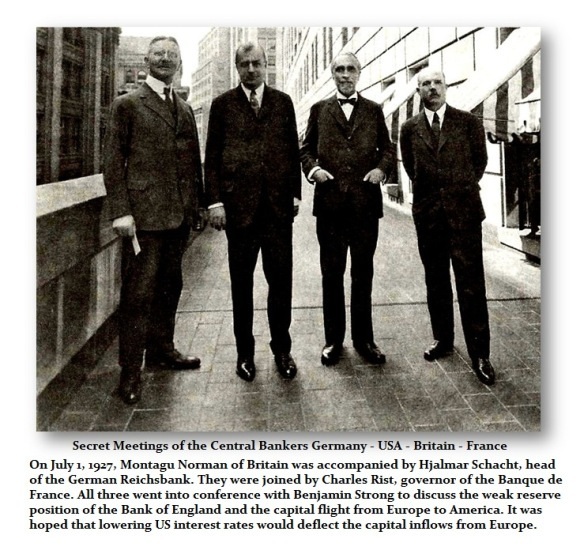 They lobbied the US Fed to lower its interest rates, as they have been doing of late once again, in hopes of altering the capital flows and diverting the flow back to Europe. This is once again why the Fed has put raising rates on hold currently — the same strategy that failed back in 1927. 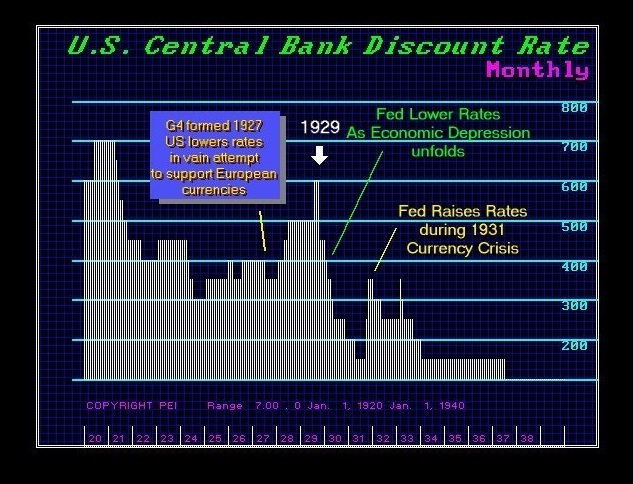 The Fed indeed lowered US interest rates in 1927 (see chart below). However, just as quantitative easing has failed, lowering the US interest rates resulted in the opposite expectation. Instead of the capital diverting back to Europe, it intensified into the US buying real estate creating the Florida land boom and pushing the US share market to record highs in 1929. As I have said many times, these people try to reduce everything to a single cause and effect. This is why Keynesian economics has completely failed. Even Paul Volcker back in 1978 in his Rediscovery of the Business Cycle pointed out that this new era of Keynesian economics had utterly failed. Nonetheless, the economic community keeps trying to make it work. It is like sticking your finger in a power outlet not understanding why you are getting shocked so you keep trying. The Fed lowered the rates in 1927. 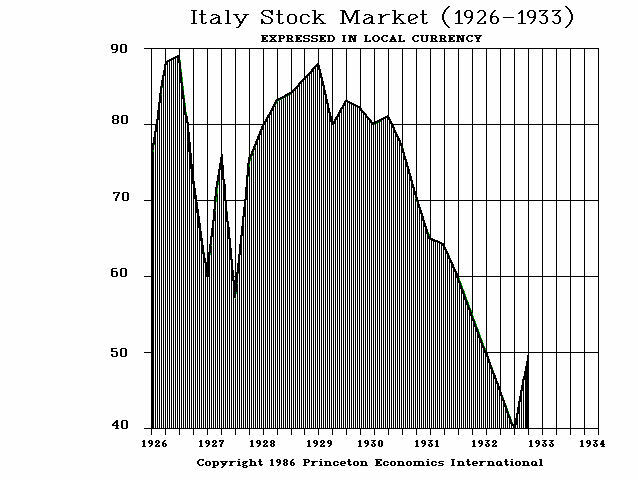 Then as the capital inflow really intensified and began pouring into the USA because of European politics, the Fed nearly doubled the interest rates into 1929 without succeeding in preventing the stock market rally. The Fed will most likely make the same mistake once again following Keynesianism. Expect them to chase the stock market raising rates and ignoring the rest of the world because the Democrats will blame the low rates of the Fed as benefiting the rich. « Is the FED Throwing in the Towel?